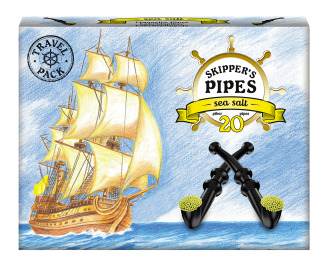 Guaranteed smoke-free pipes with a taste of salty liquorice, a favorite available in a pack of 22 pipes. glucose syrup, wheat flour, molasses, sugar, sea salt 4,7%, liquorice extract, colours (e153, e100), starch (i.a. wheat), preservative (e200), thickener (gum arabic), coconut oil, flavouring, glazing agent (beeswax).